This KC and competition style sauce does sweet right—with layers of sugars balanced by vinegar, tomato, and a simple, yet effective, mix of spices. Mike and Joe Pearce are the brother duo behind Slap's BBQ and their tale treads familiar ground, with one difference in the end. Like most, the two had a passion for barbecue and began a competition team— Squeal like a Pig BBQ—in 2013. After some quick success on the circuit, they landed and spot on the BBQ Pitmasters show and ended up taking 2nd place overall in the 5th season. The brothers then took the next step and opened their own restaurant that is located right in the middle between Kansas City, Missouri and Kansas City, Kansas. Along with slinging smoked meat, they also sell a sauce and rub and offer competition cooking classes. But while most teams cut back or call it quits in competition after establishing a business, Squeal like a Pig is still rolling strong, hitting up to 35 comps a year. A sweet and tangy molasses-based aroma fills your nose on first whiff of this sauce. There's a bright tomato fruitiness akin to ketchup serving as a base. That strong sweet smell has layers to it that includes honey and sugar along with the molasses. There's also light oniony and peppery notes, although there is not hint of heat in the aroma. 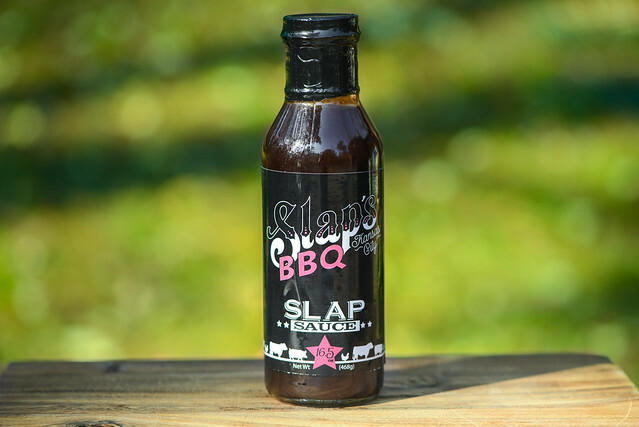 This sauce has a maroon hue, smooth consistency, and a super glossy sheen. It's semi-transparent, making it easy see tons of spices that are mostly small red specs, but there's a few larger pepper seeds in there as well. The sauce also has a medium-thin thickness and syrup-like texture, which has it falling in a quick, smooth, and continuous pour off of a suspended spoon. Only when almost all the sauce had left the silverware does the stream switch to quick drips, and when all is said and done, a thin coating of sauce is left clinging. 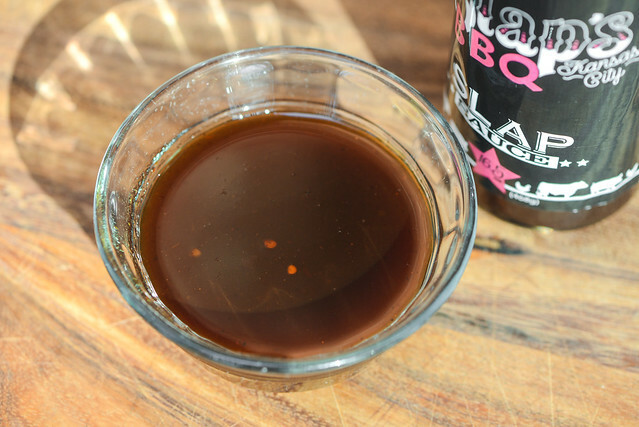 The first taste of this sauce is super sweet, but also layered with a mixture of honey, molasses, and a little vinegar that adds an initial light tang. As the sauce settles on the tongue, the acidity turns up just a notch at the same time a fruity tomato mixes in, giving this a pretty familiar barbecue flavor. Then light tastes of onion, garlic, and pepper work their way in right before the vinegar ramps up a little bit more, leaving a final aftertaste that is a nice balance of sugar, vinegar, and spice. On the grill, this sauce initially looked like it was just sliding right off the chicken. This made it take a few brushings over indirect heat to gain a pale orange coating of sauce. When moved directly over the fire, there was some light caramelization and no burn off. Unfortunately, what looked like a pretty light sauce coating translated into an underwhelming flavor. Mostly the chicken had a mildly sweet flavor with a minimal tang. Almost all of the layers of flavors and nuances from out of the jar were lost after being cooked. 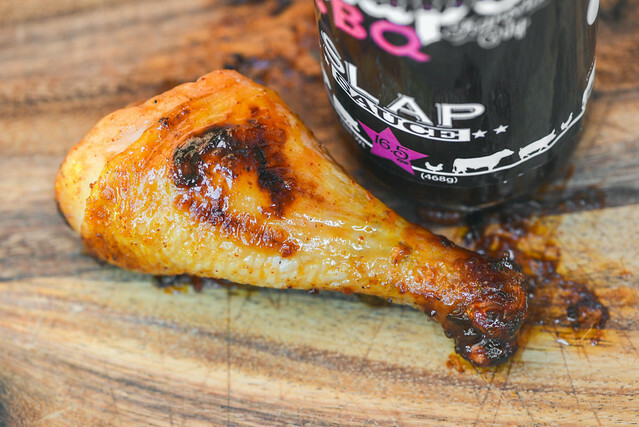 Kansas City sauce is usually defined by being tomato-based and sweet, and that's pretty much what you get with Slap Sauce, except there's a competition twist that enhances the glossy, shiny character that can output some really pretty barbecue. 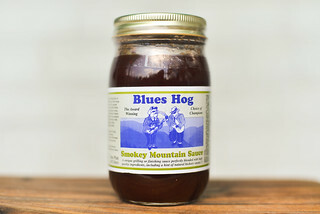 With both KC and competition as inputs behind this sauce, it's no surprise that it hits the sugar hard, but it does so in a really great combo of molasses, honey, and cane sugar that adds depth to that defining character. 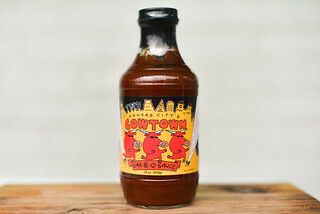 Out of the jar, there also a really great balance of tomato, vinegar, and spices to make this sauce a solid choice to dress pork, slather on ribs, toss on wings, and more. It's main fault is its cooking qualities, which left the chicken with not enough sauce and too lightly seasoned. I would think this sauce would be fine if you're using a rub to do the heavy lifting, but if your using the sauce alone, I'd opted to keep it in its raw, more robust state. I had the chance to drop by SLAPS in KC last summer. I must say i really enjoyed the experience. I was met there by Ardie Davis aka "Remus Powers, PHB" I had told Ardie I was in town with my friend Joey and would love to meet up with him. He recommended we meet at SLAPS. 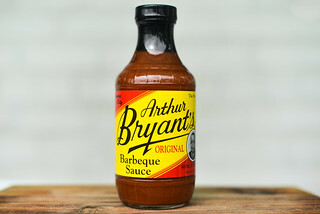 He and my late father had been close friends in the BBQ world for some time. Ardie bought us all a sample platter of all the SLAPS items. Everything was great, and I tried each meat with their mild sauce and hot sauce respectfully. I liked mild version of this sauce, but as with many KC sauces it was super sweet. I liked the hot sauce a lot more, as it was sweet, but was more tart and tangy, and the heat was not overpowering. If anyone is ever in KC this place is a must! It is a shame, that we can�t buy that sauce in our country. It seems it is intended for only USA market.